We want you to play well on the disc golf course. That is why we strive to make the best discs on the market. But our passion for disc golf goes further than discs. We want to make the best apparel that looks stunning and makes your life easier on the disc golf course. Availability will vary over the season and from year to year. 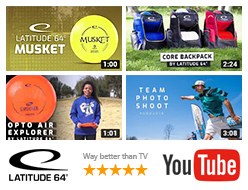 Check you favorite dealer for the latest apparel from Latitude 64°. High quality materials is essential when making clothes for disc golf. We want to keep you dry and comfortable, and we also want to bring some style to the disc golf course. Availability will vary. The Latitude 64 Golf Shorts are designed for a pleasant disc golf experience. Sweat-wicking, light weight, stretch fabric will keep you dry, comfortable and help you move freely. Available in black and grey. Sizes: 32, 34, 36, 38. • Material is highly breathable resulting in a lightweight, quick drying and highly breathable garment. • Four way stretch fabric for a greater range of motion. • The fabric features anti-microbial properties and is resistant to pilling. • Two front slash pockets and two rear patch pockets. Perfect to store your mini disc for easy access. • Small embroidered Latitude swoosh on front. • 95% Polyester, 5% Spandex. We have a wide selection of caps from Latitude 64°. Is Flexfit, Trucker or Snapback caps your favorite? We got them. Check the latest at your retail store. These high end sports socks are made for athletes. The bottom of these are thick and absorbent. You will feel the difference after a long day at the disc golf course, and your feet will thank you. A towel is essential in every disc golfers bag to wipe of dirt and water from the discs. These towels are sublimated and comes in various designs. This towel measures measures 70cm x 50cm (27 inches x 19.5 inches). The WindBuster Umbrella has a double canopy design and raindrop shaped wind-release vents to help keep your umbrella from turning inside out during those windy rounds. 150 cm (60 inches) wide when open. 100 cm (39 inches) long when closed.